When do our compromises turn into toleration? Let’s think about this for a minute and breakdown compromise and toleration. We’re taught that compromise is part of making a relationship work. It’s the give and take between two people. We start tolerating really long hours instead of taking care of our self and our families. We start tolerating how someone treats us instead of sticking up for ourselves. We start tolerating that pain in our body instead of seeking treatment or figuring how we got that pain in the first place. We tolerate that weight gain instead of changing our eating and exercise habits. When we start compromising too much – it reaches a toleration factor. You’re no longer compromising here and there, you’re outright tolerating something. This robs us of our precious time and energy. How often does this toleration consume thoughts in our head and deviate us from what we really need to focus on? When we carry this concept into the rest of our lives, we too often fail to recognize these daily tradeoffs. We’re not conscious of what we’re choosing between. Instead we’re glued to our daily to-do-list. And, work that to-do-list all day long. We need to wake up and recognize there are tradeoffs with every choice we make. A healthy compromise: I’ll work late on Thursday so I can spend half of Friday with my kid on a field trip or leave early for a weekend road trip with friends. An unhealthy toleration: A colleague continues to demean you at meetings in front of a client. Take a moment – What you are tolerating in your life right now? Look at personal, professional, financial, health, hobbies, etc. What efforts can you instill now to change the current landscape? It’s not easy. We’ve all, at one time or another, purposely avoided dealing with an issue. I’ve been there, too! Yet, I learned the hard way. I lost who I was in the process. When we avoid something, we compromise our true self and our desires. What I want for you is to unleash your best self. 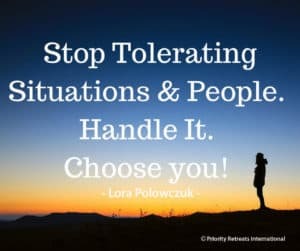 To do this, we must stop tolerating and promptly, without further delay, handle the situation at hand. Your heart and mind will thank you for it. Do you need help in expressing your courageous self? Join me for a complimentary session and let’s get you back on track! Want an Epic Life? 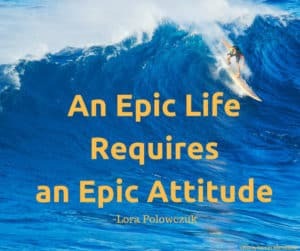 Have an Epic Attitude! Is it me or does it seem that people are complaining right and left, whether it’s about politics, their job, or something else? I often here this complaining. And, we wonder why we’re not a more happy society. Complainers are annoying to be around, right? Sadly, I used to be one of those people until I changed my own perspective. What we tend to forget is that, it’s up to us to create the meaning in each day. No one else or thing can do this for us. What do you bring to each day to make it better? We crave an epic lifestyle yet want it handed to us on a silver platter. 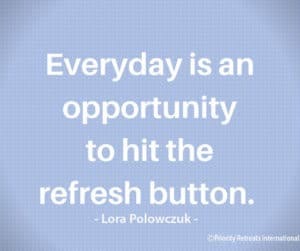 In order get this epic lifestyle, it’s within us to shift our approach to each day. When we shift our attitude, we shift our life. Be grateful – It’s so easy to forget all that we have. Running water, indoor plumbing, a refrigerator, eyes to see and feet and legs to walk. Take a minute and be thankful for 3 things in your life every morning. Do a kind gesture – Do something unexpected for someone else and don’t expect anything in return. Whether it’s paying it forward at a local coffee shop or calling a friend to see how their day was, smile at every stranger you pass, are a few ideas to brighten someone’s day. Take the courageous leap – By taking a bold step into uncertainty, you’re willing to grow and see what the future holds. This courageous leap opens the door to even more possibilities than you even thought were possible. For example, you decide that your living location needs upgrading. By searching for new neighborhoods, you find one that you didn’t know existed with even more accommodations than you even wanted. Learn something new – School doesn’t end once you graduate. Growing and learning is just as much of adulthood as living an apartment or buying a house. Without learning and growing, we would stay stuck as the 22-year old that graduated. Continue to learn new concepts and challenge your own thinking. What will you learn this month? What book will give you new insights? Acknowledge the other perspective – Say what? Yes, be willing to listen and learn how others see a problem or situation. You don’t have to agree with the other perspective. Hear them out. Be open to learning something new in the process. It may be learning how to do a something more efficient. For example, we may not agree with corporation X. However, if you learn what they took into account to make a decision, you may learn that something else was a higher priority. By living these principles, we develop an epic attitude for life and all that it offers. We develop persistence to continue going after our goals and the perseverance to keep going when life throws us a curveball. Which principle speaks to you the most? And, why? Based on these, what new habit can you start to create an epic attitude for your life? Wishing you an epic day!